We had the opportunity to review the digital download of the The Magic Stories from Allsaid & Dunn, LLC, publishers of The Reading Game and authors of the Wordly Wise series. Reading is one of the skills that, if not learned, will cause a child a great deal of difficulty as they grow older. Many children do well with a basic reading program. Although that is probably the best choice, other children need just a little bit more to make reading fun. Allsaid & Dunn, LLC has come up with a fun and entertaining way to not only improve reading skills, but also promote values. 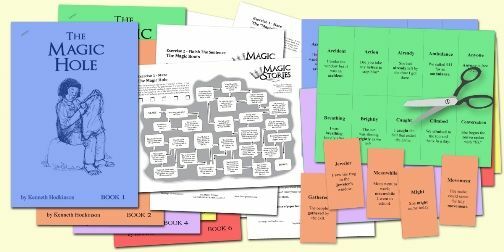 We had the opportunity to review The Magic Stories collection, which includes six stories geared towards children in second and third grades. The collection is available as a PDF download and also may be viewed on a computer or iPad. 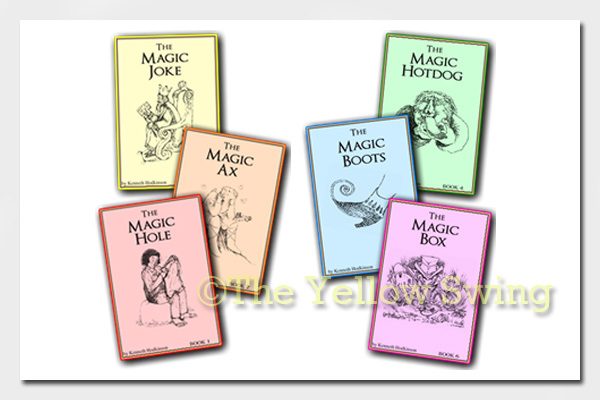 Book 1 – The Magic Hole – Ping Ho finds a bag with a magic hole which changes her family’s life. Although I prefer a physical book in hand for reading, I like that the stories are able to be viewed using an electronic device. That saved me having to print and bind or finding somewhere to store loose story pages. With curriculum like this, we have been able to put our electronic devices to more use than just for playing games. Canyon and I read the stories together taking turns reading per every few pages. The Magic Stories are about 15 to a little over 20 pages long. At the end of each story are a group of words called The Naughty 40. These are some of the 40 Naughty Words from the Magic Ax, by Kenneth Hodkinson, Book 2. As you can see, they are challenging words. These are words that your child will see throughout the story. Some were challenging due to their spelling, definitions and just big words. Canyon’s favorite activity was The Naughty 40 words. He enjoyed learning new vocabulary words (that’s my boy) and we spent time doing that activity. He chose a couple of words each day to practice using when talking to everyone that day. Some of the fun activity worksheets included after reading the stories are exercises in finishing sentences and stories, mazes and more. Something else I liked about the stories was the content. Although there is a mention of magic in the title of the curriculum, the stories are ones Canyon and I enjoyed reading together. I would say there were more like fairy tales with Rumpelstiltskin and goblin boots. Good values were shared in all of the stories. The Magic Stories was something Canyon enjoyed returning to on his own and reading by himself. These are a great product that will promote learning fun for your child.